Digital signage is a growing subset of signage, drawing a strong cross-section of markets because of its versatility and function. Don’t fall behind on the trend. Make your business more iconic with modern digital signs and interactive displays. Measuring customer engagement; and more much. Digital signage provides you with a unique opportunity to interface with customers and employees alike. Digital signage systems allow for easy monitoring, letting your team to make changes or updates to your message at any time. In short, display what you want, when you want it. Teaching rooms or lecture halls. We provide digital signage installation in Tampa, Orlando, Fort Myers, around the southeastern United States, and across the country. We will travel to you. Contact us today to speak to a sales representative and set up a personalized analysis of your needs. BCI offers a comprehensive process to leave you with premier digital signage in your sports arena, restaurant, hotel, or other location you want to upgrade. 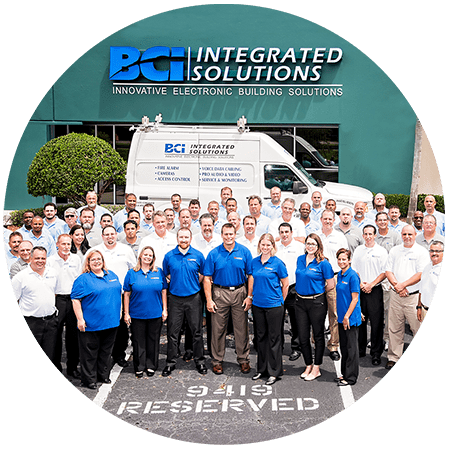 BCI uses top-of-the-line systems to create a customized digital solution that works for you. Our design team can visit your space, determine its needs, and install a digital signage solution that works for you. No matter what you need, the ability to throw it up on a screen and make it more available to you and others is invaluable. We typically design solutions to fit your specifications, and work with you to keep them running for years to come. Our signage and the management applications used to run them are frequently upgraded over time to provide you with a continuously powerful tool for your work. Our employees have the knowledge to facilitate any digital signage design-install throughout the Tampa Bay area, across Florida, and anywhere in the southeastern United States or the country. Several BCI employees, including our sales representatives and technicians, are recognized as Certified Technology Specialists by InfoComm (now AVIXA) and possess specialties in Design or Installation. Our team will use their knowledge and experience to deliver you the digital signage that meets and exceeds your needs. BCI tailors its solutions to each customer, but our digital signage technology usually uses Planar digital signage displays for crystal clear communications. We can work with any existing system you may have, and can create a digital signage system that will help your company excel no matter how complex it may need to be. Talk to us today to receive a comprehensive proposal for your project.